The two images I took for this mod are using a few other mod packs. Chiefly visible is Mayic's Farming mod and Russiandood's Survivor's Katana. All other content and assets using in the mod are from 7 Days to Die. A modlet in truth that adds a couple alternative recipes and 1 new item designed around corn and starch chemistry. Using corn meal you can create glue with murky water in the chemistry station at level 3 of "Yeah, Science!" While modestly expensive, at 10 meal per glue it provides an alternative to bones that will be useful for the mid- and late- game crafting scale. Since plastics can be made from starches I also made recipes for scrap polymers using corn or potatoes. This too is gated at level 3 of "Yeah, Science!" Since most gasoline available is made with ~10% ethanol I decided to allow for the creation of "Regular Unleaded" which is usable as a fuel source for augers and chainsaws. 100 units of Regular Unleaded is made from 90 Gas Cans and 1 jar of grain alcohol. Unfortunately, it seems that vehicle and generator fuel is hardcoded at the moment so I was unable to make my fuel usable in that case. 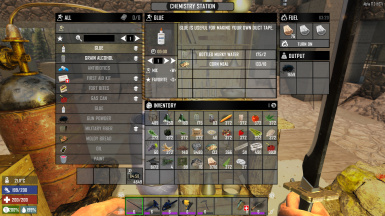 However, I found it that most fuel usage later in game is with tools so an extra 10% yield will be quite helpful. I also modified various crafting recipes that use gas to incorporate my changes. Finally, I added a corn meal recipe using Mayic's Grain Processor from his farming mod﻿ that allows for 3 meal from 1 corn. This modlet does not require Mayic's to function but will show that recipe as available. This is my first modlet so if you have any comments or pointers please let me know. In the future I may expand this modlet. A special thanks to Russiandood﻿ for helping me make this modlet! Remember to always back up your saves and do not test your new mods on your active games as he kindly reminded me before I disregarded his advice to my dismay.